Deck out your classroom for a spooktacular Halloween with pumpkin lanterns, scary sudoku and ghostly faces. A haunted pathway leading up to your classroom – refuse bags are really useful for this – will capture imaginations. You can hang spiders (see below for tips on making these), streamers and tape above it. Make a sign to direct students to your spooky setting or, for a novel twist, create a treasure hunt for students. Check out this example for inspiration. Pirates, creatures of the night, or goblins and ghosts – there’s lots to choose from. If your theme is a haunted hospital, for example, create a section of the classroom with gruesome body parts, such as eyeballs (grapes) and brains (noodles). Or if you’re showcasing creepy creatures, put false spiders in jars filled with hand sanitiser – they’ll look eerily suspended. For more inspiration, check out these drawing exercises that explore the symmetry of black widow spiders and vampire bats. The sounds of your haunted setting (of which there are lots to choose from online) will have students on the edge of their seats. Involve them in creating a creepy atmosphere by getting them to record their own piece of spooky music ahead of the lesson. Or get everyone involved in a singalong with these spooky song lyrics from Musical Contexts, which can be sung with familiar tunes such as The Addams Family . Create effective lighting by making a leaf from green card and cutting orange card into strips to make pumpkins. Put flameless tea lights at their centre for a safe but spooky mood setter. As well as arts and crafts, this annual celebration lends itself to literacy and storytelling. Get students to write an original story about why the classroom is haunted or encourage them to write detailed descriptions of the textures and colours they can feel and see in the room. Explore other areas of the curriculum, such as maths and science, with a pumpkin weighing exercise, which teaches children about making a hypothesis and basic experiments. Ask students to predict the weight, height and width of the fruit. 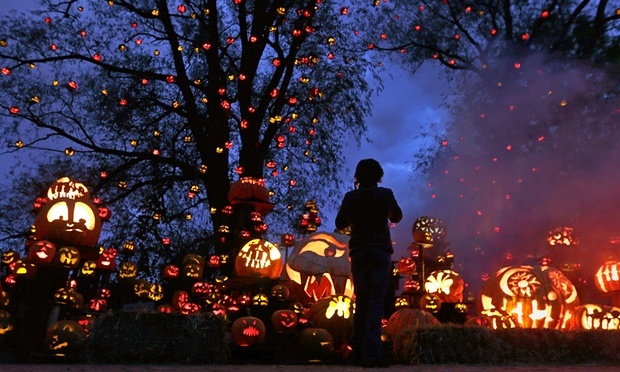 Can your pupils predict whether larger pumpkins have more seeds than smaller ones? Once all the guesses are in, the teacher can cut the pumpkins open to find out. Twinkl also has a spooky sudoku to keep young brains ticking over, along with these character cards . Finally, make sure any lessons are filled with laughs with these Halloween themed jokes by PrimaryLeap . These DIY ghost picture frames are guaranteed to make your students do a double take. You can also spook them with hidden ghost footprints. Simply paint the sole of your foot and press it against the card, adding googly eyes and a ghostly grin. Place spiders in drawers and get your class to make their own handprint creatures by painting their palms and pressing them down with their wrists touching. The palms will become the body of the spider and the fingers the legs. Add googly eyes and, for a spooky touch, some fangs. A bit of role play will add to the magic of the day, so ask colleagues to dress up too. You could even invite them in as special guests. If your classroom is themed around historic figures, for example, you could get other teachers to dress up and enter as different characters from the past. If you’ve chosen to theme your room around a particular book then get colleagues to re-enact parts of the story or set up a question and answer session with the “characters”. Note: Make sure you warn parents and students about the haunted house, and check it’s suitable for children with medical conditions.